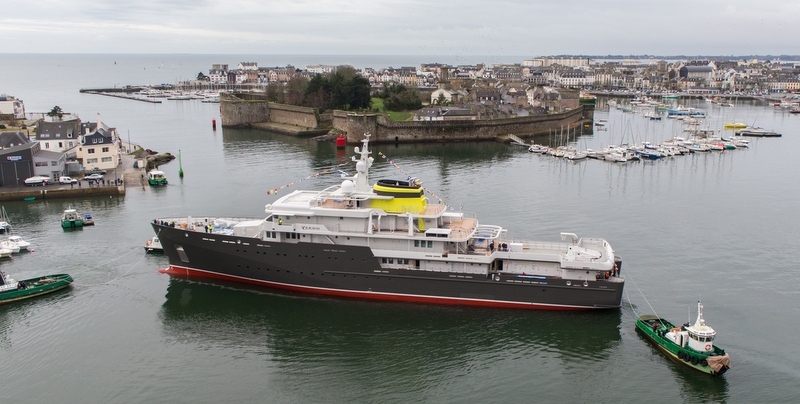 77m explorer yacht YERSIN launched by Piriou – Superyachts News, Luxury Yachts, Charter & Yachts for Sale. Multipurpose travel vessel, all seas, all weather, but respectful of the environment, expedition yacht YERSIN associates a complex technical platform to a high comfort and security level. o “ICE 1C” class, the hull is reinforced over the entire length. Built for remote and extended transoceanic cruises within extreme weather conditions (- 20 °C, + 50 °C), be it on seas, rivers and lakes with a high degree of reliability in any conditions. o ”CLEANSHIP” class, meeting the owner will of a clean and green ship. o “PASSENGER SHIP” class, offering a high level of comfort to the 18 passengers on board. Designed to focus the reception of engineers, scientists and technicians passengers in overseas missions, YERSIN yacht is also a very functional vessel: it is composed of two laboratories, a multi-purpose room, a media room, a theater, an infirmary, a scuba-diving room, a container-storage platform.